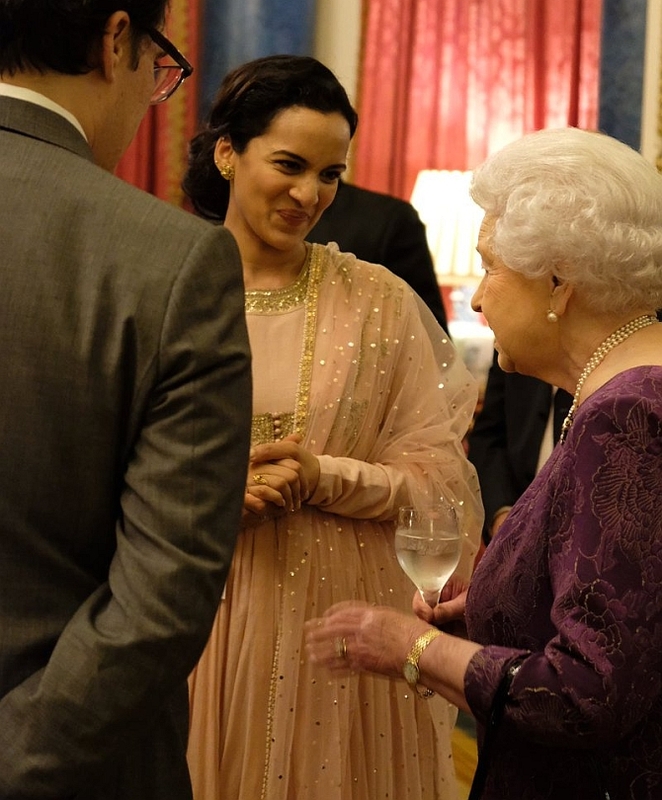 Queen Elizabeth II had an impromptu lesson in Indian dance mudras, or ritual hand gestures, when the 90-year-old monarch met celebrated dancer and choreographer Arunima Kumar at the Buckingham Palace. 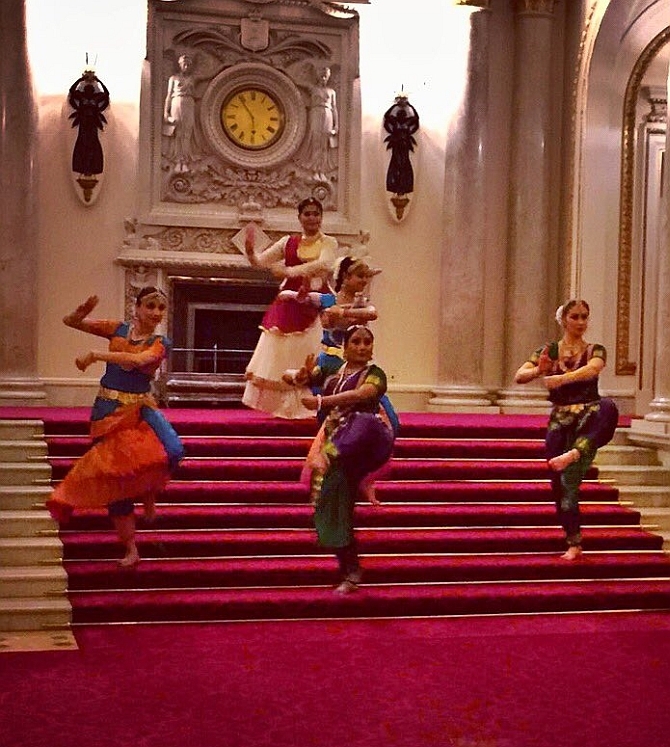 The Queen had hosted a special reception on Monday evening to mark the launch of UK-India Year of Culture 2017, where Kumar had choreographed a unique dance sequence titled 'Ekam'. "I met the Queen and she literally made the mudras with me. She asked me how I do all those moves because they are quite complex. And, I showed her some hand gestures and she copied me and that moment I will remember for the rest of my life," Kumar said. "She is just so amazing. She knows everything about everything. She was able to talk to us about our art with such ease and imbibe that in such a way; it was a very special moment and it inspires me to keep doing what I do and encourages me to do better," said the UK-based dancer, who had choreographed the sequence for Akademi. Kumar, the daughter of former Delhi Police commissioner Neeraj Kumar, herself performed a Kuchipudi dance number besides the choreographed number showcasing the various dance forms of India. 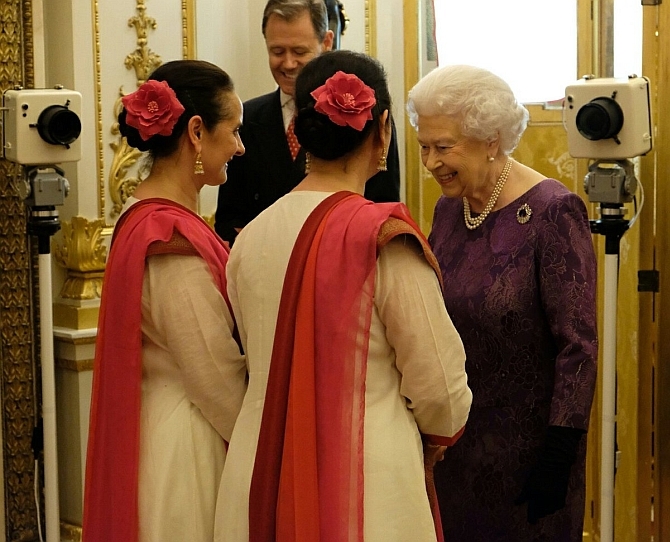 "It is sense of achievement and honour that together with all my dancers we brought Indian art into Buckingham Palace. It is a moment we will remember for ever. We have created history, not just for ourselves but also for India," she said. The reception brought together high profile guests from various fields across India and the UK and the Government of India was represented by Finance Minister Arun Jaitley. "This only re-emphasises the importance which is attached to the Indo-UK relationship. It launches a heavy calendar of events that will celebrate our excellent relationship with the UK over the decades," the minister said. Jaitley was joined by Indian celebrities like sports star Kapil Dev, actors Kamal Hassan and Suresh Gopi, singer Gurdas Mann, fashion designers Manish Arora and Manish Malhotra, choreographer Shiamak Davar, and industrialist Ratan Tata, among others. Priti Patel, the senior-most Indian-origin minister in the UK Cabinet, was among the British parliamentarians at the event. The minister for international development had held bilateral talks with Jaitley just before the reception at the palace. "As a member of the diaspora and a member of the British government, it's amazing to see the depth of the UK-India relationship. I've been able to have discussions with minister Jaitley on the political situation in both our countries and the incredible trade opportunities that we have," she said. London's Indian-origin deputy mayor for business, Rajesh Agrawal, described the event as a "landmark" for UK-India ties. "UK and India have a shared history on so many fronts. Celebrating 2017 as a UK-India Year of Culture is a big landmark. In the last 20 years India has progressed a lot and our relationship needs to be constantly refreshed," he said. 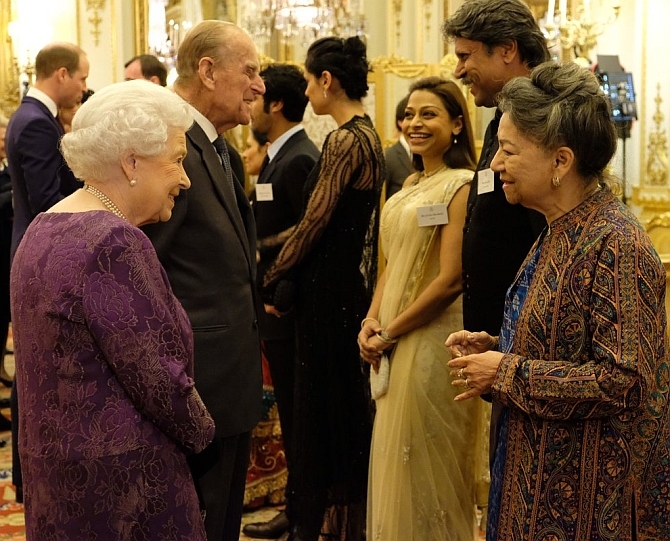 The Queen was joined by her husband, Duke of Edinburgh, and grandson Prince William and his wife Kate Middleton who mingled with the guests and talked about their past visits to India. "I was born in Hounslow (west London), a British kid who grew in New Delhi and then moved to America and then ended up on this TV show ('Big Bang Theory') and all my dreams came true. So it's really come full circle to be invited by the Queen," US-based Indian-origin actor Kunal Nayyar said. British Indian actress Ayesha Dharker said she was "completely overwhelmed" to be part of the event. The event also included a first-of-its-kind projection of a unique artwork on to the facade of Buckingham Palace of the national bird of India, the peacock. The projection was designed by Studio Carrom, a Bengaluru and London-based design studio. "We wanted to ensure people knew this was about India but which would also surprise and intrigue people, encouraging them to follow the UK-India Year of Culture," said Studio Carrom. The celebrations kick-start a year-long calendar of events and exhibitions across both countries.